IRKUTSK, September 12. /TASS/. Total deliveries of the Russian passenger jet MC-21 are planned at the level of about 870 aircraft, with more than a half of them to be supplied to national air carriers, Deputy Prime Minister Yuri Borisov said on Wednesday. "The starting portfolio of 175 firm orders has already been formed, with advance payments received under all firm contracts. Total deliveries are planned as about 870 airplanes, with more than 50% to be supplied to Russian airlines," the official said. Serial deliveries to customers should start from 2020, he added. 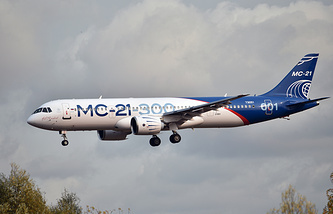 The MC-21 aircraft is a medium-range passenger aircraft. It is the second large-scale Russian project after Sukhoi Superjet 100. MC-21 has been developed by the Irkut Corporation and the Yakovlev Design Bureau of UAC. The MC-21 made the maiden flight in Irkutsk on May 28, 2017.